I’m getting a little too excited for summer. 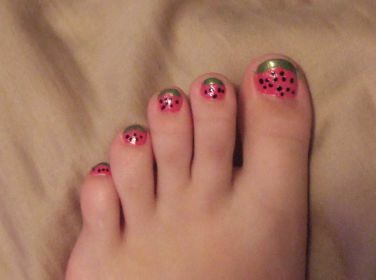 Here is a watermelon pedi I did, kinda messy, but still cute. 1) One thick coat – Sally Hansen Hard As Nails: Xtreme Wear (320) “Fucshia Power”. 2) Create french tips – Sally Hansen Hard As Nails: Xtreme Wear (260) “Ivy League”. 3) Using small end of dotting tool, make dots or seed shapes using any black polish.